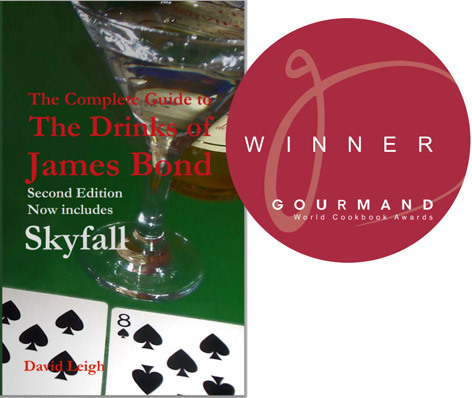 Published at the end of 2012 following the release of SkyFall, the second edition of David Leigh’s The Complete Guide to the Drinks of James Bond includes drinks from Ian Fleming’s novels and the entire 007 film series. Learning of the award David was surprised to even find his book had been entered for the competition and says, “when I heard it had won at the country level and saw myself on a list that includes Jamie Oliver I felt very honoured, but at the same time completely shocked”. All country winners are to be displayed at the Beijing Cookbook Fair (19 to 22 May 2014), with The Gourmand World Cookbook Awards being announced at StarPark Studios on 21st May in front of 1,000 guests. David is a lifelong fan of James Bond and founder of The James Bond Dossier website, as well as a contributor to MI6 Confidential magazine. With his in-depth knowledge of 007 he's in an excellent position to provide information regarding the books and films to fans and media organisations. The book is available as a paperback on Amazon.co.uk or as a paperback or Kindle edition on Amazon.com.